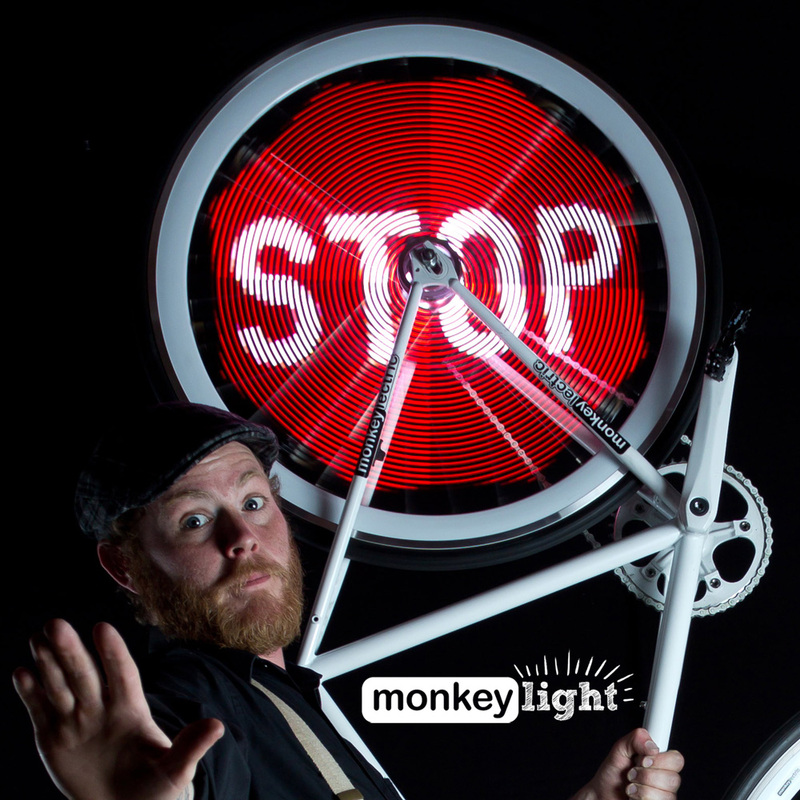 The Monkey Light Pro creates stunning images and animations within a bicycle wheel. Once you're rolling the display fills the bike wheel and is visible from both sides. The Monkey Light Pro is waterproof and durable, and is designed for use on city streets. Crank your bike to eleven. The Monkey Light Pro was successfully funded on Kickstarter. It's now in stock and available for anyone to purchase. Earlier prototypes of the Monkey Light Pro were custom made for exhibits and developers only - you may have seen one at Maker Faire, Siggraph, Dragon's Den, EuroBike, SXSW or at a museum. 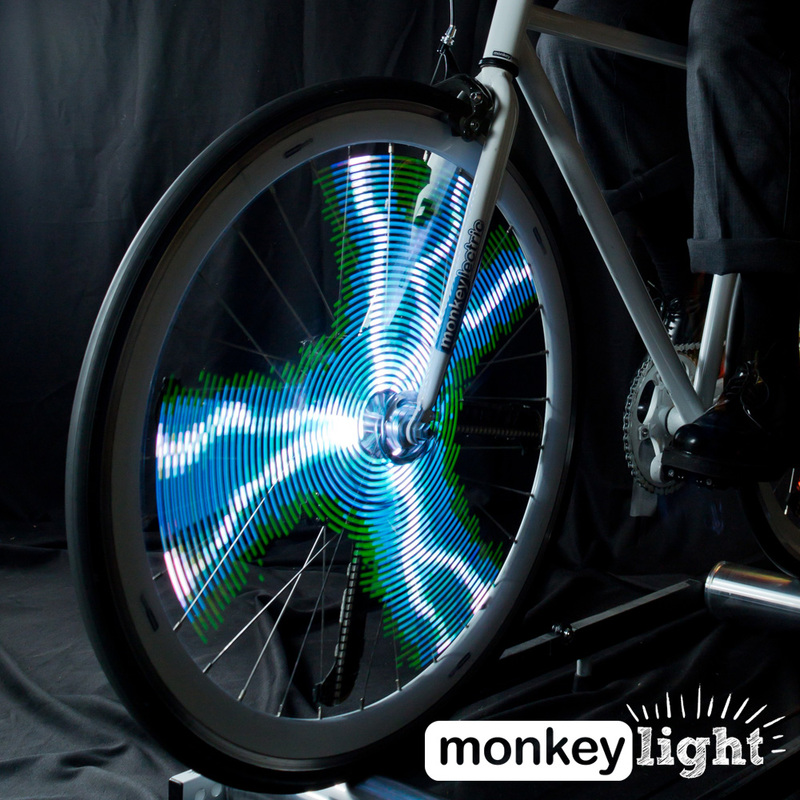 Download images and animations to the Monkey Light Pro and display them while you ride. Use the web-based software to create a playlist with your own graphics, or choose from our collection of custom artwork. Then wirelessly send your playlist to the Monkey Light Pro. Application developers are welcome. 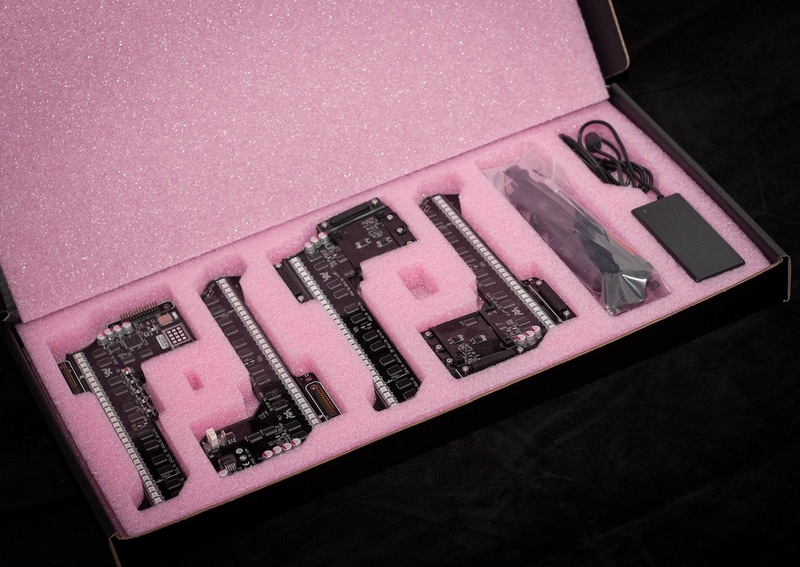 Our software and API are available with an open-source license. Make a moving installation with a bicycle, or use our POV360 Display for fixed installations. Battery Runtime: 3-8 hours at full brightness, up to 48 hours at reduced brightness. Runtime depends on what graphics are shown. Media format support: JPG, GIF, PNG, AVI, MPEG, MOV, QT, FLV, and more. Wheel fit: 26", 700c, 29". Maximum hub diameter 58mm. 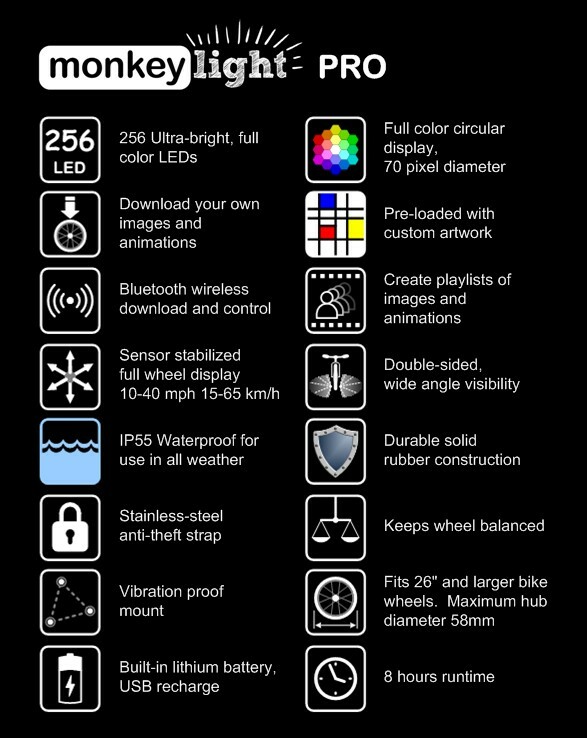 To get you started we'll pre-load the Monkey Light Pro with an amazing image and animation collection for you to use. Over 10 artists have created artwork specially for the Monkey Light Pro. We're really excited to be able to give you a curated collection of work from David Ope, Yoshi Sodeoka, Devon Penney, Shelley Eshkar, Kevin Kunzman, Natalie Walsh, Katya Popova, Noah Vawter and more. Application developers are welcome and encouraged. Our playlist, download and control software and API are available with an open-source license. Use Bluetooth wireless to download graphics and control the Monkey Light Pro. Make a moving installation with a bicycle, or use our SM1 powered display stand for fixed installations. The Fukushima Wheel project outfitted a bike with pollution sensors. As you ride around, it collects data from the environment and displays it on the wheels. The Science Museum of Minnesota created an educational display. Our own staff created an interactive 3D spherical display (video below). Sign up for a 10% off coupon! Sign up to our Monkey Fun Newsletter. We'll let you know about Videos, Contests, Shows, Sales and more! © 2019 Monkey Light Bike Lights. All rights reserved.